The other day, with a whole heap of folks coming to dinner, I had one of those crises of confidence in which you are suddenly convinced there won’t be enough food. Of course there was. But during that moment of doubt I recalled that in the fridge were a cauliflower and half a bunch of spinach, and the cupboard always has chickpeas. And I had for weeks wanted to try making a version of a delectable simple chickpea, silverbeet & cauliflower number I’d eaten twice now at Bodega (the Surry Hills tapas restaurant which I reckon must have some of the most blindingly delicious and original food in Sydney). So I gave a version of this salad a try, as a little side dish to go with the tagine and the couscous, and it was not half bad. Next time I’d make the cauliflower florets larger as mine became a little too soft (and the Bodega cauli is deep-fried, I think, rather than roasted), but I have to say the flavour and texture was quite delicious. It’s a perfect quick side dish and chock full of goodness. Break cauliflower into small florets, toss in a bowl with a good few glugs of olive oil till well coated, then spread over a baking tray and roast in a hot oven for around 30 mins or until golden brown. Meanwhile, heat olive oil over high heat and add drained chickpeas. Add salt & agitate in the pan until the chickpeas are well coated and begin to turn golden. Remove chickpeas with a slotted spoon to kitchen paper. Finely chop the spinach stems and add to the hot oil, fry till the pieces begin to crisp. Turn off the heat and add the leaves until they wilt. Gently mix the chickpeas, roasted cauliflower and spinach with the garlic in a bowl. Add the lemon juice and cumin, adjusting to taste. Serve with a little chopped coriander to garnish. And now, friends of the oyster, I am taking a fortnight away from blogging – am off to a writing retreat to try to finish my novel. See you soon! Remember my quest for Australian garlic, which then resulted in the talented Cate Kennedy sending me some of her garlic shoots? Well, that garlic is coming along nicely in my garden as we speak, this one pictured here next to the tomatoes and some purple basil and salad greens – tricky in my small garden to do the right companion planting, as Stephanie Alexander tells me it won’t grow well with peas and beans, both of which I’ve got a little further away. But, while Cate’s garlic will hopefully tootle along, it takes six to eight months for it to grow, and a girl’s gotta find a substitute in the meantime, right? So, praise be to the lovely purple cardboard box that arrived by post this week. 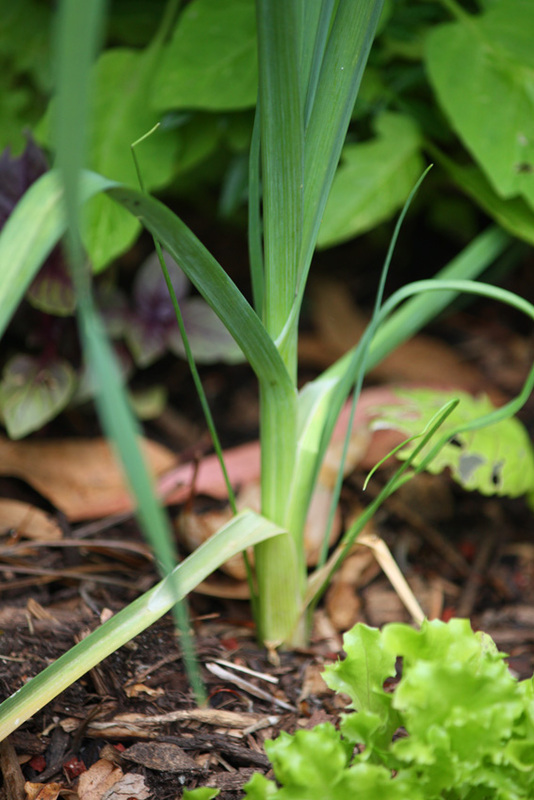 Some time ago I had heard of Patrice Newell’s organic biodynamic garlic available online. 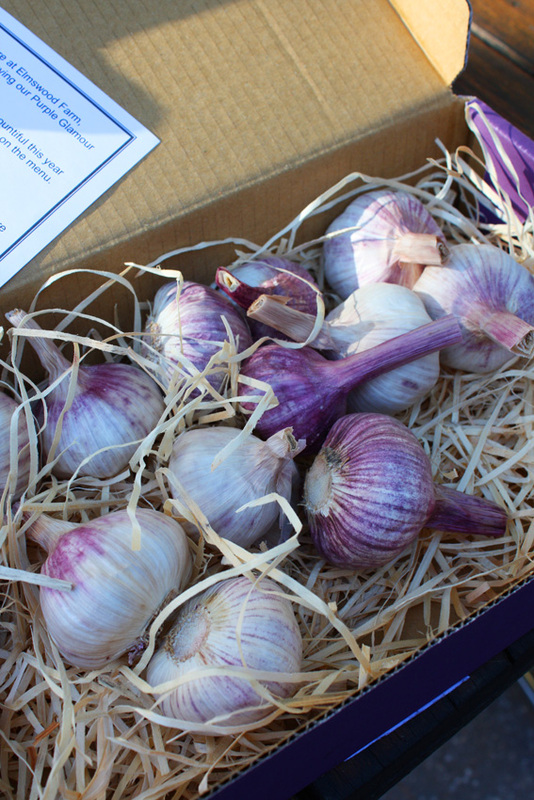 I registered monthsago, way back before her harvest time, and then forgot about it until receiving an email a couple of weeks ago, telling me Patrice’s “purple glamour garlic” was ready to go, and did I want some? Yes I did, despite expecting it to be horrifically expensive. I thought ‘bugger it’, and got online. And to my surprise found that a kilo of garlic, which turns out to be 16 gorgeous heads of the stuff, was $38 plus about $5 postage. So we’re talking $2.70 per head of garlic. And what garlic it is. We had our first taste the other night, and I cannot tell you how fresh and moist and delicious it is. The kind of fresh you see sometimes in very new ginger, just glistening with juice as you slice it. The instructions that come with the box (elegant, recycled and recyclable packaging) tell me the garlic will last for five months before sprouting if kept in a dry, well ventilated spot, and your kitchen bench is recommended as good a place as any. I was staggered at that keepability, which makes me wonder just how old is the garlic we’ve been buying at the grocer, which often begins to sprout after a week. But this is a bit of a moot point, because at our usual rate of consumption we will get through it long before five months. And I’ve begun taking a bulb of this garlic with me every time we visit a friend, because it’s so good I reckon it’s a cracker gift to take along to dinner with a bottle of wine. So actually I expect I’ll be on to my next order very soon. 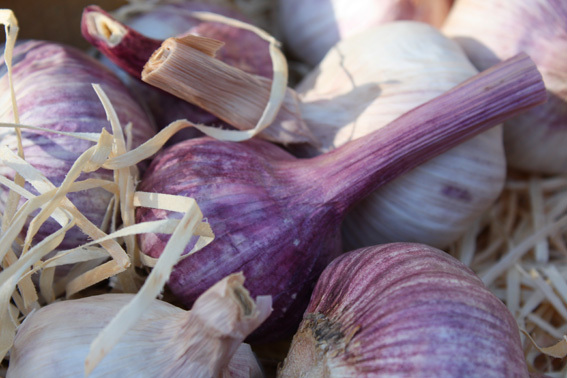 If you check out Patrice Newell’s website there’s lots of interesting facts about garlic – including the advice to never keep garlic in the fridge, as dryness is crucial. And anyway – as you can see, it’s so beautiful, who wouldn’t want it on display? Last night we christened our finished new kitchen with dinner for eight [plus four kids, who spent the evening rushing between playing Abba records on the turntable in the studio and bashing away on musical instruments in the spare room, which is still piled almost to the ceiling – literally – with crap, outdoor furniture, washing machine etc. Two of them spent several hours perched precariously atop piles of junk, sitting in a washing basket playing the xylophone and maraccas while Senor made very sure their parents didn’t see. Anyway – our friend Ricardo, the Lunging Latino, showed up with the most beautiful present. This is one of the first bulbs of his home-grown organic garlic, grown in a pot in Balmain. It’s too beautiful, almost, to use. But of course we will. I’m going to save one of the little cloves to try to grow some myself. Thankyou Dicky! And while we’re on the topic, can someone tell me the best way to store garlic? In the fridge or out? Read the rest of this entry ?